It has been a little while since we have gotten some more details on the highly anticipated sequel, Avengers: Age of Ultron. Today, Marvel Studios took to the forums of both SuperHeroHype and Reddit to show off some new promotional artwork for the film, as well as giving us more info on Ultron as well as The Vision, played by Paul Bettany in the film. 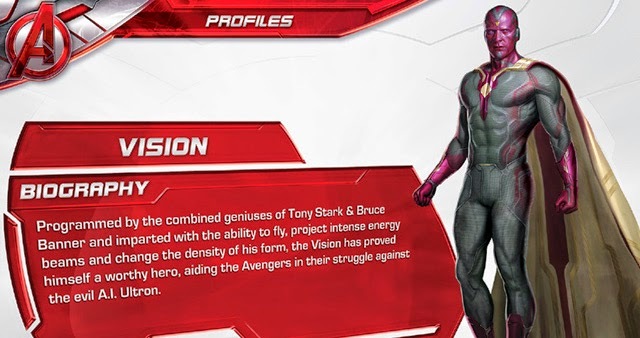 All speculation about Vision's origins are put to rest now as we have confirmation that the android is a co-creation of Tony Stark AND Bruce Banner, who helps the Avengers in the fight against Ultron. Vision seems to have the exact same powers as he does in the comics. Presumably Vision is created to stop Ultron instead of being created by Ultron at first as was done in the comics. 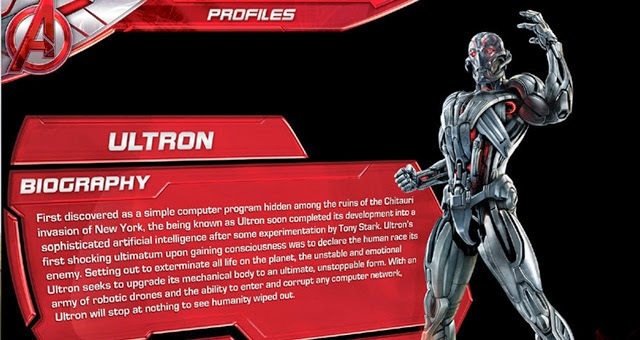 The details revealed about Ultron are a bit more surprising. It would appear the film's villain is not completely a creation by Tony Stark, but instead has origins tied back to the Chitauri invasion from the first Avengers film. Ultron having at least a somewhat extraterrestrial origin is an interesting change from what has been done before. The villainous robot is obviously receiving a largely different origin than he had in the comics, where he was originally created by Hank Pym, a character we will not see until Ant Man. You can check out both bios for the characters below and feel free to click the links above for more images from the upcoming film. Avengers: Age of Ultron opens May 1, 2015.